Hello from Woody and Pat! 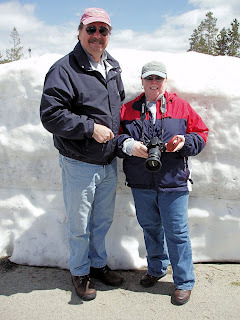 Here we are at the Upper Falls in Yellowstone National Park...as you can see it's COLD. Just before this shot, it was snowing. I'm so glad we got to see the snow in the park but I'm ready for SUN and warmth!!!! Ok...here's two shots of the same wolf...he was way far away and even with the 300mm lens I had to really blow it up! The shots are a bit grainy but we'll keep looking. 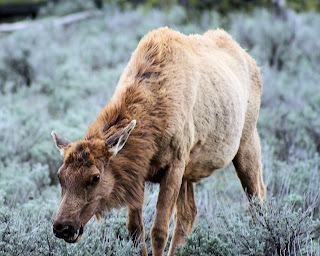 The elk in the area starting running into the river so that was the give away that something was nearby! 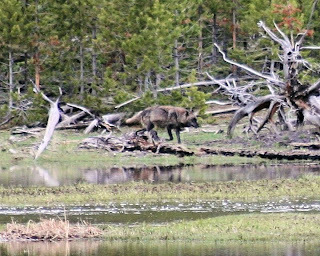 I had my doubler which gives me the equivalent of 600mm, but the wolf explained that he couldn't wait while I set up the tripod and reworked the camera....he was hungry! 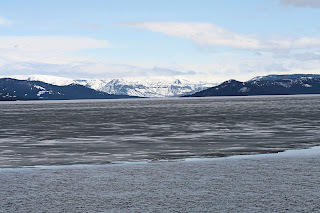 We also found Lake Yellowstone...it's the largest high altitude lake in the U.S. As you can see it's still half frozen!!! 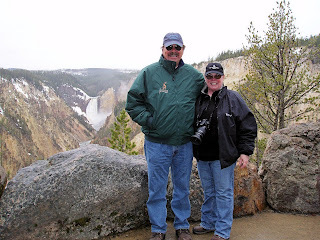 We love Yellowstone National Park. I don't even mind the snow. 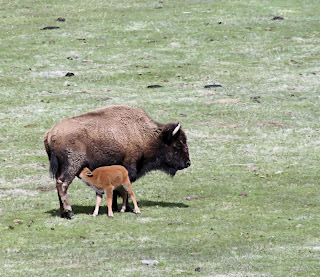 And of course...no day is complete without our baby bison! More Snow! We had two beautiful days in the park and then rain and snow since Wednesday. It's supposed to be bad the rest of the Memorial Day weekend. Let's remember those who gave their all for our country...and let's get out of Iraq! I'm afraid that my girl Hillary is out of contention for the presidency. I think she had a great message and poor campaign management. Perhaps her team took the nomination for granted and let Obama get a foothold! We'll see what happens but Obama alone can't win. This place is absolutely incredible! Here are just a few shots so you can appreciate the beauty! There is one draw back! We drove 78 miles ONE WAY to the closest WalMart!! 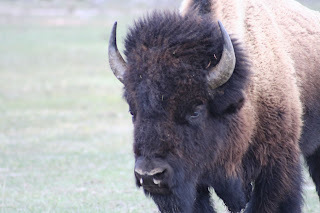 The first two pictures are in Yellowstone National Park...the bison are everywhere! We hiked in on a ridge and counted 17 babies in one herd on a meadow. 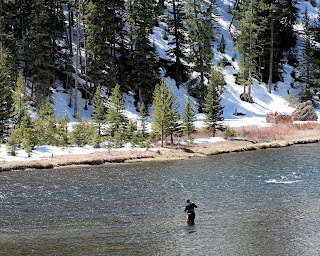 The fly fisherman is on the Madison River...the Robert Redford movie A River Runs Through It was shot on this river. 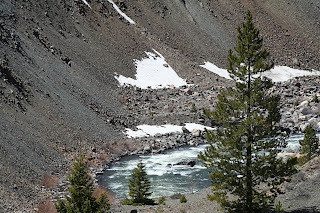 The last picture is of an 1959 earthquake caused landslide that impacted the flow of the river and created Quake Lake. On the way to WalMart, we saw pronghorns, mule deer, wild swans!, and some other birds I haven't identified yet. Tomorrow we're going bear hunting...with a camera of course. 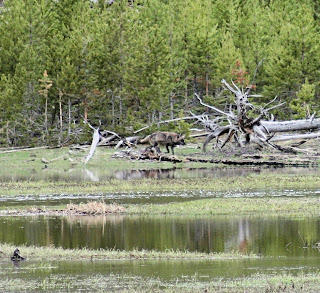 Supposedly there is a mama and two cubs that several people have told us about! Thank heaven for hiking boots! I've always felt a little funny wearing them, but not out here. Thanks Libby..mine are hand me downs from her years ago!! We worked by ourself Sunday and everything went fine! We have a wonderful boss...Brenda...she works constantly and has convinced us by her hours that we don't ever want a gallery! That's a big part of the reason we wanted to work at The Buffalo Trading Company http://buffalotradingcompany.net/index.html to see if we wanted to start our own storefront. Now I know we don't want to be that tied down! We'll just work for others on occasion. Starting this week we work Wednesday through Saturday from 3-10P...you know I can't get Woody up before 10A so evenings are best for us! We are so blessed to have this opportunity and just want to share it with all of you! We are thankful for our blessings and wish you all as many as we have...your life will be full! 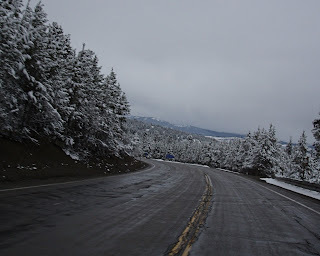 Check out these pictures of the road to West Yellowstone last night in a snow shower! 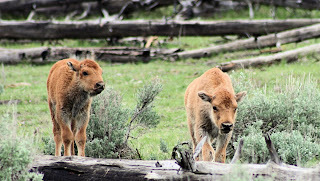 and bisons, note the fence is behind them and not between them and us! and our RV this morning when we got up! that's just kidding but look at the snow! We start work tomorrow! The Buffalo Trading Company is wonderful! I don't think I'll make any money as I'll be buying out the store! We're back on the road! Woody and I left Hendersonville on May 2nd heading to St. Louis...then on to Kansas City where I made a deposit at the Ameristar Casino...just a small one! 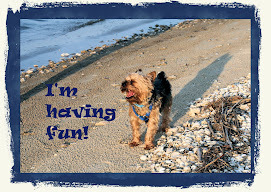 We headed on to Grand Island, Nebraska and from there the fun starts! 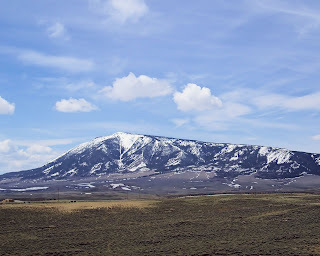 The pictures are from Wyoming! 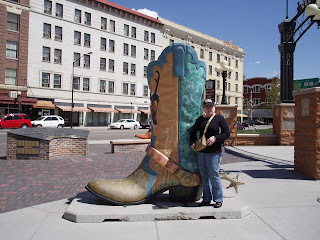 The boots are in Cheyenne, Wyoming! We had a blast finding out that the first woman governor in the U.S. was from Wyoming. We also learned that it was the first state to give women the right to vote! 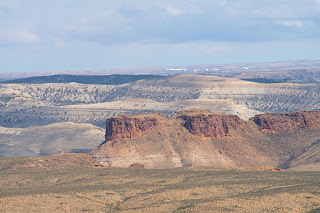 The snow capped mountain is from the highest point in Wyoming and the image of the canyon is Firehole Canyon that is part of Flaming Gorge Recreation area just outside Rock Springs, Wyoming! It was a bit overcast but still gorgeous. 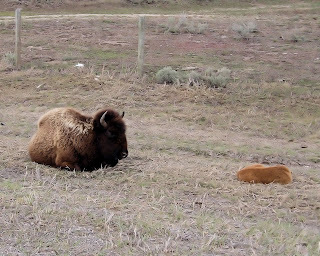 The most fun was seeing herds of antelope all along the highway from Cheyenne to Rock Springs! 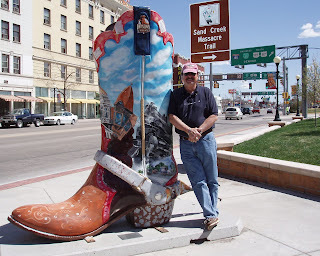 We also loved the back road drive from Cheyenne up to Laramie through Medicine Bow National Park and a great lunch at a little restaurant near the University of Wyoming. Tomorrow we head to Park City, Utah. Woody has never been there so it will be fun showing him where his dining room and breakfast room rugs came from! Donna and I bought them there and had them shipped home! We're at 6,000 feet+ and have been going up since mid Nebraska! We've been as high as 9,000 feet. 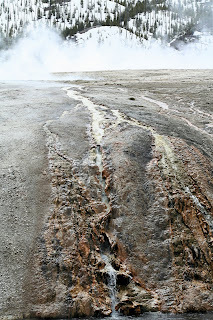 No altitude sickness. The key is lots of water! Keep that blood thin. 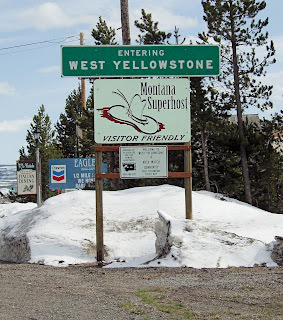 We should be in good shape for West Yellowstone on Friday! 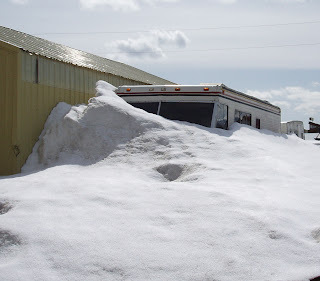 The RV is doing fine in the mountains. We do so love being trailer trash! There are tons of pipeline workers in the RV parks so the scenery is almost as good in the KOA parks as out the windows. So far the only problem was one KOA park that closed two days before we got there! Otherwise I can recommend www.koa.com any time! Harley and Andy are fine but neither one of them like walking on gravel. This area is called high desert and there is no grass! There is also a lot of wind. We've had just a tiny bit of rain after the first day on the road when a monsoon hit! That was the day of the tornados. That's all for now...miss you all!